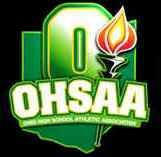 The OHSAA District Track and Field Tournament Entry process ends April 25, 2016. Schools that change their tournament participation after April 25, 2016 will be subject to a $150 penalty per sport. The athletic administrator must verify their school's tournament participation and access tournament entry form through myOHSAA prior to April 25. Mail, fax, or e-mail the OHSAA Eligibility Certificate to the district manager per district board instructions. Make sure your coaches submit the boys and girls rosters online through www.baumspage.com before the entry deadline established by the district manager/district board! Tournament entries must be submitted before the entry deadline. Only one person may have an account for each team. To submit for the coach you will need to know their UserID and Password! If there are questions with myOHSAA, e-mail Jacki Windon (jwindon@ohsaa.org) at the OHSAA office. Coaches must login and submit the numeric roster and individual/relay entries through the online entry form before the entry deadline posted for each tournament! The online entry window will open on Sunday, April 24th at 8:00 AM! Coaches that do not have an account on www.baumspage.com will need to Apply for their account. Those that already have an account will be able to Login immediately. The name, grade, and number for every athlete listed on the Eligibility Certificate. A maximum of two individual entries per event and their "most consistent" mark. A maximum of one relay team per event with their "most consistent" mark and the four anticipated relay team members. The Entry Window will close precisely at the time posted on each district tournament web site! Submit a tentative roster early and login anytime before the window closes to make final changes. Late entries will not be accepted without approval of the OHSAA and may result in a $150 penalty! Substitutions must be submitted online before 12:00 noon the first day the event is contested! The Online Scratch/Substitution Form will open after the entry window closes. Substitutions submitted after the 12:00 noon deadline will not be processed! If there are any problems with the Online Form, click the Contact Us link and submit a Help Request. Please allow 8 hours for a response. *Most responses will be in less than 4 hours. Use the Contact Us link first! In an emergency, call Gary Baumgartner at 513-594-6154 or Terry Young at 740-517-0195. If you need detailed instructions, click the Online Entry Instructions link. If you are ready to submit entries, click the Online Entry Form link and login to your account.